The RWPGM Sir David Trippier commissioned WBro David Lightbown PAGDC, District Chairman of theEast Ribble District, to provide a Provincial Presentation Trailer. The mobile trailer had to be suitable for attendance at all types of community based events, such as Summer Galas, Agricultural Shows and for general events throughout the Province of East Lancashire, to re-enforce our links and support within local communities, to promote Freemasonry, to promote the East Lancashire Masonic Charity and to aid with attracting new members. WBro Lightbown, being frustrated and disappointed as to what was available within budget from various manufacturers, turned to Bro Ian Ferrier, managing Director of IJF Developments Ltd., for some assistance. After various discussions a prototype design was agreed upon and with the assistance of Worshipful Brethren David McGurty and Keith Jackson work commenced in December 2015. The trailer is fully equipped internally with Audio Visual presentation equipment, external removable display panels, Provincial livery on all external sides of the trailer and comes complete with a 1kw petrol generator unit and is equipped with 3mtr x 2mtr Gazebo for additional space if required. 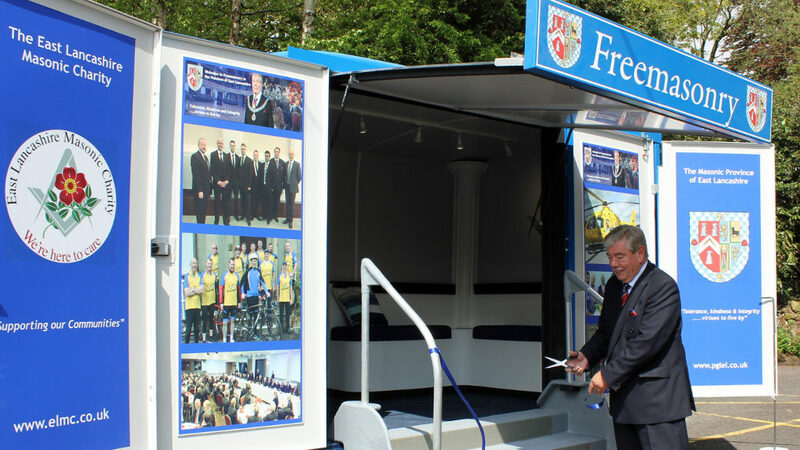 The trailer is available for use at future events held by Masonic Halls, Lodges or Chapters. In order to be able to use this new asset anyone wishing to borrow it will need to have been trained in it’s use. To book the trailer for an event please check availability on the Forthcoming Bookings table below. If the trailer is not shown as already booked, contact Whitford Caravans on 01282 420029 who will take the booking and confirm this with the Provincial Co-ordinator. The person who is to collect the trailer must have been trained in it’s use. Any person collecting the Masonic trailer must have a tow vehicle with a kerbside weight of more than 2,000 kg. The driver must also be a named driver who has attended the induction course. Provincial Trailer makes it debut!